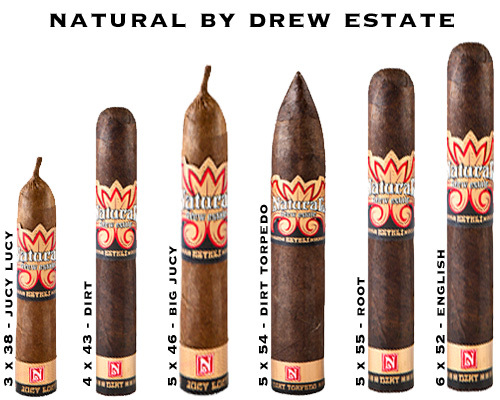 Natural By Drew Estate Cigars - Buy Premium Cigars Online From 2 Guys Cigars . Acid Natural cigars by Drew Estate are very unique smokes. From the ripe and seasoned Dirt that is named after the midnight black soil in Pueblo Nueva Nicaragua where we grow and cure maduro leaf. To the Juicy Lucy a small cigar that erupts with adventurous flavor, and a smooth, caramel flavor. There is also the distinctive Root which combines the rich flavors of a mocha cappuchino with intense notes of oakwood and wine. These Cigars will appeal to all cigar smokers.